Yesterday I went for a walk on the shrinking shores of Whidbey Island, north of Seattle, Washington. 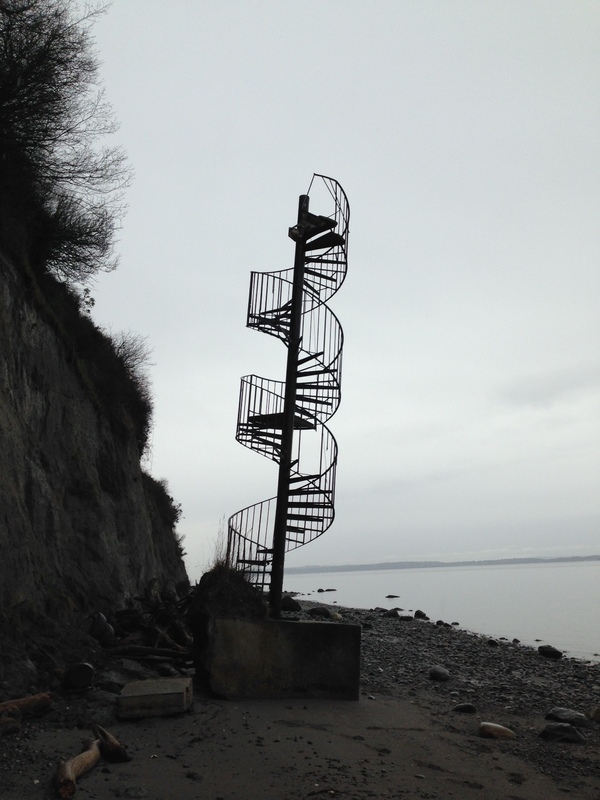 With my friends Ann, Christina and dog Gracie, we descended rickety stairs to a dodgy bulkhead to explore the ocean shore near their home, on Puget Sound. As we walked we noticed the sandy bluffs above us, and their constant sloughing. We noticed homes on the edge. We noticed grey water drainage pipes that drain onto the bluff, accelerating erosion, accelerating the risk to their homes. Perhaps they have a great view of the ocean and do not have a relationship with the ocean. Nature erodes the shores of land. This is unavoidable and undeniable. Where we choose to settle and how we choose to settle is best done when in relationship with Nature. Moreover, when we realize that we have a structure that is no longer useful, we have to figure out how to ensure that structure causes no harm. If this stair falls toward land, it will accelerate erosion. It will accelerate the shrinking shore, hastening peril to the homes above. Ann and Christina’s community has to figure out how to build new stairs – I know what they won’t do. Any structures like this in your life? In fact in The Netherlands about a third of the country is below sea level. Cities like Amsterdam, Rotterdam and The Hague were settled in a river delta at the sea shore several centuries ago just on spots that were a little above sea level. Natural dunes and artificial dikes helped to protect these settlements in times of storms and spring tides. In the west and north of our country since hundreds of years we were forced and used to combine city-development with the defending against water and we are maintaining these constructions continuously: the dunes here also are subject to slough. Sometimes the land was not protected enough (last flood disaster in 1953 with hundreds of victims, which led to new technics and more solid constructions to keep the water out. The threat of a raising sea level (and river level) is here a main issue the last decades: how to maintain the protection sufficient in the future. The last invention was a ‘sand engine’ (‘zandmotor’, google it if you like) in the sea just a about half a mile outside the coastline: by introducing some artificial sand banks in the sea the seawater streams are building up new dunes parallel to the old ones with a lagune in between. And we give rivers more space between the dikes. In fact we try to use nature to protect our unnatural position. But principally you are absolutely right: In the (far) end maybe we gradually will be forced to move higher up to the east, to leave our country or to live on floating cities (some architects are already doing experiments with floating homes and even quarters). I love your perspective from another corner of the planet, Peter. It certainly is a different situation where you are – living below sea level. Instead of falling in to the water, you could be consumed by water. But it seems your people are closely tied to the water – perhaps the threat is more immediately apparent? Whether above the water or below, both need to to be in relationship with water, not in denial. Hi Beth, the viw is wonderful I love that. It talks with you about the poeople who built it and the water which eraoded.